Tonkatsu is super easy to make and takes about 20 minutes, including prep. Traditional Japanese Tonkatsu is made with pork, but you can also make chicken katsu or veal katsu (German weiner schnitzel, which is the original katsu, is made with veal). Generally, you can katsu-fi any kind of meat, so use what you love to eat. 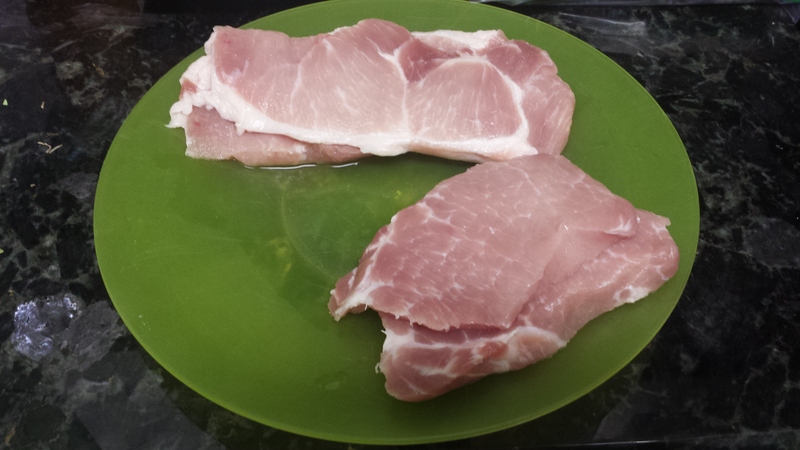 Start by trimming the fat and cutting your cutlets in half. You can also pound out the cutlets to thin them and break down the toughness of the muscle fibers instead of cutting them in half. I usually trim the fat off my tonkatsu, but leave it for my fiancee because the fat is really good for flavor. It’s up to your preferences as a cook. Next, you will bread the cutlets. Start by organizing your “assembly line” so to speak. You will want one plate of cutlets, one plate of flour seasoned with salt and pepper, one bowl of egg (make sure you break the yolk and beat it well), one plate of panko breadcrumbs, and a pan of oil filled to about 1/4 in depth (or half the depth of your cutlets, depending on how big they are). Start with 1 cup flour, 1 cup breadcrumbs on the plates, but keep everything handy because you will likely need more. Turn on the oil so it starts to heat while you bread the cutlets. I usually put my stove top on medium-high heat for the oil. Take the first cutlet, thoroughly coat it in flour, then coat it in egg, and finally coat it in breadcrumbs. If the oil is hot enough, you can add it directly to the pan; otherwise, set it aside while you bread the next cutlet. Continue breading until all the cutlets are finished. You can start cooking them once the oil heats up. You don’t want to crowd the pan, so cook the cutlets either one or two at a time, depending on the size of the pan. For example, the pan below can comfortably fit two cutlets. To cook the cutlets, place it in the hot oil. Keep your distance because it will pop and sizzle a lot. 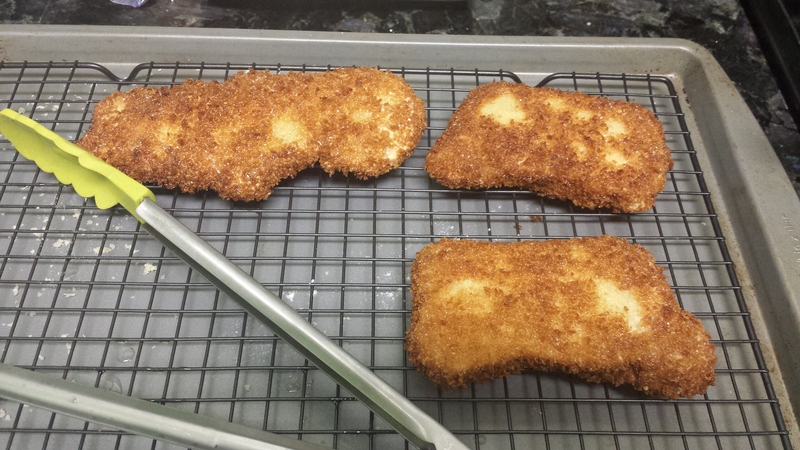 Cook until the panko turns a nice golden brown, then flip and again cook until it is golden brown. Once finished, move the cutlet to a drying rack to become crunchy (the contact with air is what makes fried food crunchy). After you’ve finished cooking all the cutlets, cut them each at the thickest part and check if they are done (i.e. make sure they aren’t still bleeding). 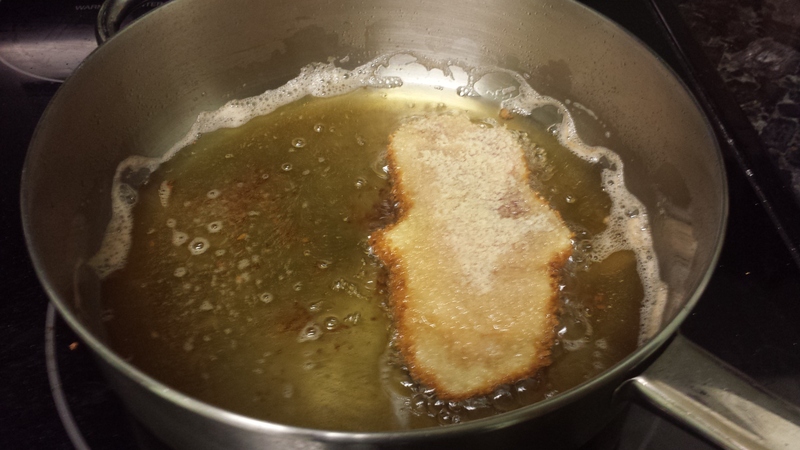 Sometimes, depending on the oil, your panko will brown too quickly. If the cutlets aren’t finished, throw them in the oven at 400 degrees for about 5 minutes until they are cooked through. Finally, cut your cutlets into bite-sized strips and serve with rice and veggies. You can also purchase Tonkatsu sauce (Bulldog is a good brand) at your local asian grocery to go along with it. I highly recommend this sauce drizzled on top; eating tonkatsu without tonkatsu sauce is like eating fries without ketchup. Enjoy!